If so, full marks for embracing a new technology ... check out http://www.coroflot.com/andrewmorson/muse for a few insights! That's an interesting route that hadn't even crossed my mind. There would definitely be advantages with going in that direction and it would be interesting to see how they turn out. From what I understand about 3d printing (which isn't much) slopes and such generally come out looking more like stair step. I will admit it has been a couple of years since I heard that so the technology may have evolved since then. ...... the technology may have evolved since then. Check out http://www.engadget.com/2010/12/29/3d-printed-concert-flute-rapidly-prototypes-sound-video/ for starters. It's an interesting idea, and perhaps one day ocarinas will be made that way, but the PR isn't one of them. I trust I am on the waiting list for the first production "batch" - Patty wanted to talk about the cost, and I said, for this one, I really don't care, I am getting it! With the time and effort that has gone into this model so far (which I can only fathom a fraction of), I'd say it will be completely worth it...whatever the cost - which I'm sure will still be reasonable all things considered. We know the quality is going to be incredible, the durability - superb! Plus it's a completely new design. I'm really looking forward to this. Bakelite could be interesting but would scratch too easily. I suspect one of the problems with all of this has to do with making molds if that applies. I'm curious, did he use any of the 3d printing technologies to prototype this instrument? No 3D printing, and no molds. These ocarinas will not, at least in the short-term, involve manufactured ("mass-produced") parts, as do the current MOs. In the longer term, I guess anything's possible. Concerning the low B... The PR will not have it, and the reason is to keep the size of the PR as compact as possible. To my surprise, adding just that note involves adding not just a little bit of extra volume, but quite a fair amount. The PR is a good deal more compact than 12-hole ocarinas, and this is why. It's also why the MO C that we currently have doesn't have a dedicated low B tone hole. I know that compactness is not a huge priority for everyone, but for Karl it definitely is. He has established a brand identity for instruments that are durable and compact enough to be carried everywhere, without being a bulky inconvenience. He intends to continue to work within those constraints, as much as possible. There is, of course, a dedicated "low B" tone hole, R4, for the second chamber, but that note is B2, not B1. That's part of the chamber overlap design. If the exclusion of the low B means keeping the design small and compact then I'm all for it. It was a huge part of the deciding factor when I bought my poly G and C and is still a quality of the MOs that I value immensely. I'm glad Karl is sticking to the original aim. 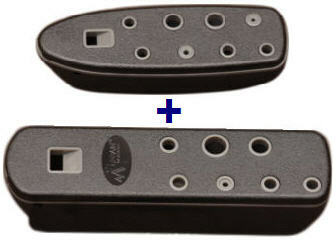 A new model probably wouldn't feel much like a Mountain Ocarina if it was a dreadnought by comparison to the others. Intuitively, I'd expect that low B to add only a small bump in size to the ocarina, but in actuality it's a significant bump, as Karl explained to me -- especially if you want a strong sounding note there. Anyway, I'm not bothered by it. I'm much more interested in the chamber redundancy, with "low" B available on the upper chamber. That makes a HUGE difference in playability, by reducing the number of required chamber switches around the octave break. Interesting about the low 'B'. Also unfortunate since one of the advantages of ocarinas come from having subholes. A nice advantage over tin whistles and recorders. And I wouldn't be surprised if they're using a CNC machine to get these going. That's probably still the most effective way to produce custom items, especially if you know how to program one properly. It just requires some solid stock material of appropriate size. How about a granite ocarina? I actually have a couple of tin whistles with low C, which I almost never use. I did miss the low B tone hole on the MO C for a while, but I found that eventually I was able to produce a low B, or lower, by tipping the ocarina up and shading the window with my upper lip, and to do so with little or no breath cut. This got easy enough that I ceased to think of it as a workaround. On the PR, the voicing window is on the bottom, so obviously I can't use the same method. I did experiment on the prototype with a breath cut for low B. It worked, but of course the note you get is weaker. It remains to be seen whether the release model will work better for getting low B. As a general thing, I found the pitch on the PR prototype to be more stable than it is on the MO C, and I think that has a lot to do with the design of the chambers--very different in shape from the current MO. These sorts of things are the last details that Karl is working out now.